Geddy Lee is in a home mode. Briefly, savouring the last few precious days of domestic sanity before the deluge. In the basement of his Toronto Beaches' home, in a wood panelled, sound adjusted sanctum strewn with splendid "toys" his elaborate listening room, Geddy speaks in hushed tones, gathering the strength he knows he'll need for the days ahead, the imminent release of Rush's Moving Pictures and all the sound and fury that will inevitably follow. The interviews, the lip-service, the promotional wranglings, detailing light and sound equipment, transportation scheduling, the road food, the screaming fans and ultimately the performance. "IT'S MY LAST WEEK before we start rehearsals for the tour," he says, "and thankfully, this tour won't be as heavy as in the past. This year we put our foot down - we're getting older, we've all got families now and we need to spend a week each month at home." Even so, the honed-down schedule is a monster - beginning in mid February and stringing out into a staggering line of back-to-back concerts through 25 American states as well as Ontario and Quebec till the end of June - and no mention yet of the band's proposed European tour. This monumental undertaking is the result of an intuitive change in Rush's original 1981 blueprint which was supposed to have yielded a second live album gleaned from last summer's British shows. It was supposed to have been a year in the glide mode, according to Geddy. "We had all these plans set up for a live album of dates in Europe and maybe some in Canada," he says, "and sometime last spring we found our jams at sound checks were suddenly getting very interesting. I guess deep down all of us felt we should be writing rather than hanging out for another year, living off a live album. Something got into Neil about doing a studio album instead and the more he thought about it, the better the idea seemed. He brought it to us, and Alex and I started getting excited about it. "We cancelled all our plans for the next two years on the spur of the moment, and I think that abrupt about face really inspired us to make this album something more than if we'd stuck to our original schedule." What resulted from the pre-Christmas sessions at Le Studio in Morin Heights, Quebec, is an album of consummate strength and surprising melodic and rhythmic directness. Surprising for Rush, that is, whose work, prior to last year's breakout effort, Permanent Waves has been characterized by Geddy Lee's teeth-numbing histrionic shrieks, convoluted philosophical diatribes and melody-rhythm structures that seemed contorted and artificial. If Permanent Waves set a trend with more attention to even construction and more controlled, detailed instrumental coloring, Moving Pictures is a confirmation of that maturing process. "This band looks at things with the long view. We go through periods where we might all be hot on some particular subject, or some musical focus - all that changes from album to album," Geddy explains. "Some albums have been very passionately in favor of certain philosophical ideals, like individualism, others have been more atmospheric or picturesque. People have read things into our work at different times that just aren't there - political viewpoints, religious observations. Most of our songs are motivated by simple, personal philosophical expressions - and they change as we do. "I assume that most of our audience is intelligent. I have to assume that. There are two ways you can write songs - either you approach the lowest common denominator or you assume everyone out there is the ideal listener. We prefer the latter approach - we try to appeal to their intelligence. "We tried to continue something here that we started on Permanent Waves," he continues. "We used to write pieces, movements and stick them together into some format or other, and with Hemispheres we figured we'd accomplished the most we could get out of that concept - of being a band that works in completely technical movements. With Permanent Waves we very much wanted to get back to writing good songs, and this time we took it one step further. it for ourselves. We were afraid of writing something that was too easy to play, I guess, in case it got boring. "I think in the process of attempting that, we learned it's not so easy to write something simple. It was a difficult adjustment for us." For all that, Moving Pictures is both an exciting and accessible work, a series of interlocking visions and narratives bound by Neil Peart's refreshingly sparse, incisive lyrics, whose concerns range from a futuristic car race ("Red Barchetta") to a genuinely heartfelt, even plaintive view of life on stage ("Limelight"), to an atmospheric evocation of society as censor ("Witch Hunt"), the album's one "production number" featuring some marvellous synthesizer work by Hugh Syme, who also designed the album package) to an uplifting finale in "Vital Signs" with its swift, unlabored mind-as-computer metaphore and its lingering chorus, "Everybody got mixed feelings / About the function and the form / Everybody got to elevate / From the norm..."
Lifeson, Peart and Lee are uncharacteristic examples of the rock 'n' roll lifestyle, Geddy says. They live in a protective bubble on the road, a close knit family whose emotional needs seem satisfied from within. Outside intrusions are carefully scrutinized, if not actively discouraged, and the pressures that seem to motivate many performers are for the most part internally initiated in Rush. "We have to remove ourselves physically when we write and record," he says, "from our families and home environments. There are too many distractions. There are other pressures we put on ourselves. Probably one of the most appealing aspects of changing our minds and doing this album, for example, was a subconscious desire to put the pressure on, to prove to ourselves we could come up with a great record from scratch, without prior plans or ideas. Before Permanent Waves we had reached a certain level of success, we sold a consistent number of records, but since the success of that album, I think we feel more confident - all of a sudden people came out of the woodwork to see Rush, and we prefer to think we managed to reach those people legitimately, although we've certainly done well by the resurgence of interest in heavy metal. Permanent Waves was a good record - we felt the pressure this time to make a great one." Moving Pictures' most noticeable departure from the Rush norm is perhaps in Geddy Lee's vocal restraint a change in style that might possibly disappoint the band's more strident headbanger fans, I suggest. "Well, I'm getting old," he smiles. "I can't just scream all the time. It got to the point where my voice was purely an instrument, an effect. I guess now I'd rather sing, utilize my knowledge of melody and technique - a feeling everyone in the band shares, probably from having forced ourselves to play more than one instrument each. You can't help but open up to more melodic possibilities. As a singer it has made me more aware of what I can do with my voice, instead of what people expect me to do. "I don't think I can really be concerned about the audience's expectations of me as a singer, in the essence of it. Rush exists because we love to play and each year we want to get better than we were before. Each album is like an exam - we continually test ourselves against past efforts in order to gauge our growth. That's what's most important. "At this point I don't see any end to the possibilities open to this band. Obviously, the public has a lot to say about that, but creatively, I can safely say that it's more fun and more of a challenge now than ever before. I feel very fortunate that we have a band that has been able to survive most normal and many abnormal conflicts. "And I think we've been able to achieve that by isolating our goal to a simple function - nothing is more important than the performance - no interviews, no external concerns, nothing can diminish the importance of our performance. Once you've agreed on that, every other decision - and we're involved in every decision made in our name - becomes simple." The Rush-Max Webster connection evidenced on Max's monumental 'Battlescar', the Universal Juvenile cut that combined the two bands in a single, almost nuclear performance, continues on Moving Pictures, with the opening track, 'Tom Sawyer', co-written by Pye Dubois. Geddy says Rush have a long standing admiration for the work of Dubois, Kim Mitchell, Gary McCracken and the recently returned Terry Watkinson. "It was amazing - seven of us in Phase One studio, with Jack Richardson bobbing up and down in the middle," Geddy says of the combined session. "The whole room shook - most of the track was live off the floor. It was very exciting for us. We don't often get to work with other people, and Max is special. "I'm pleased Terry and Kim have reconciled. They're equally valid writers and musicians - both important to each other. I can see it going a long way." Probably the most refreshing aspect of Moving Pictures is that this album continues the band's direction towards being a little more commercially assessible without compromising the esthetic values of their cerebral lyrical imagery and instrumental prowess. Just as Permanent Waves produced Rush's first full-fledged A.M. single in The Spirit Of Radio, Moving Pictures offers a couple of cuts that should soon become familiar on the radio dial. The most effective being Tom Sawyer, a number whose lyrics were co-written by drummer Neil Peart and Max Webster lyricist Pye Dubois. Limelight also has commercial possibilities and the Sci-fi Red Barchetta is of equal radio interest. 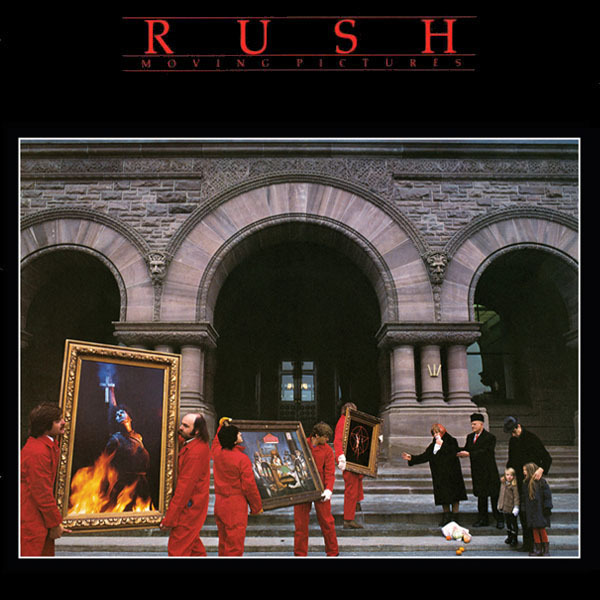 Moving Pictures also allows Rush the scope to stretch out instrumentally with YYZ being particularly effective as a showcase of Alex Lifeson, Neil Peart and Geddy Lee's musical talents. With Lee lowering his vocal registry a few notches, it might be adventurous to say that Moving Pictures is the group's most accessible album to date. With fine production work by Terry Brown at Quebec's Le Studio facility, Moving Pictures certainly continues Rush's reputation as brilliant studio musicians and creative composers. Rating: 9 (By Keith Sharp).